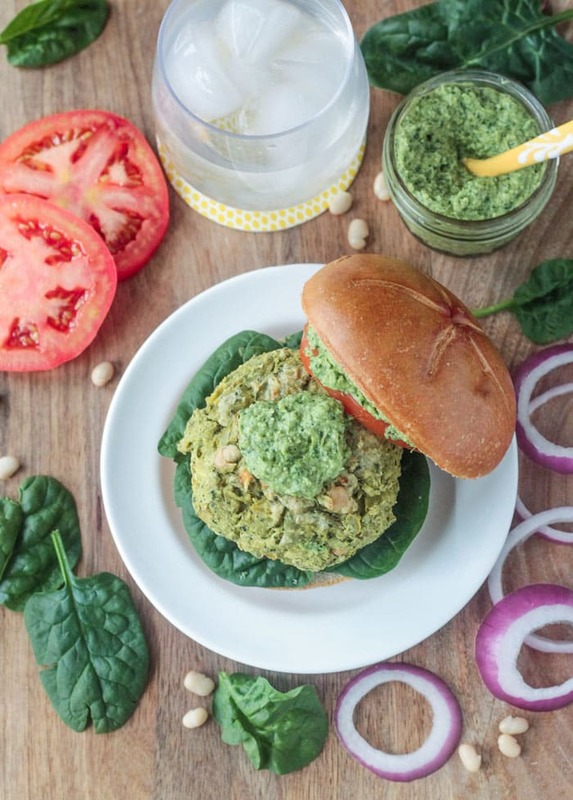 Spinach Artichoke White Bean Burgers – all the flavor of the delicious dip in burger form! Super easy to make too! I promised you some new recipes using my Spinach Artichoke Pesto when I first posted about it on Instagram several weeks ago. I meant to have this one to you sooner, but I just wasn’t happy with any of the pictures I was taking of them. It’s a hard color to photograph! 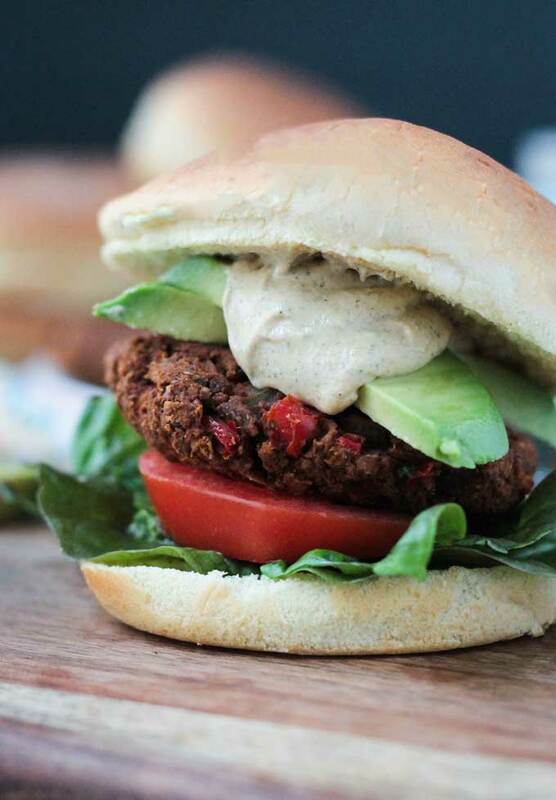 But, despite the color issues, these White Bean Burgers are so flavorful and delicious!! They taste like spinach artichoke dip in burger form. They hold together perfectly! Top them off with the pesto for an extra flavor bomb. Everyone in the family loved these! Like I mentioned above, I created these burgers around the same time I created my pesto. I was so in love with the pesto that I just had to put it on everything. And my brain just kept spinning with more ideas for spinach artichoke goodness. These White Bean Burgers immediately popped into my head. Mostly because it would allow me a surface to then add even more pesto! Put them together and you’ve got double the artichoke, double the spinach, double the delicious! Traditional spinach artichoke dip isn’t exactly healthy. Sure, there are the obvious veggies, but then there are all sorts of dairy and oil added. This burger is gluten free, dairy free, egg free, nut free, oil free, and vegan. It’s also full of nutrients so you can feel good about eating it. Arrowroot Powder – similar to cornstarch, but a healthier alternative. It’s non-GMO and no harsh chemicals are used to extract the starch. This is the magic that holds this burger together so well – no mushy burger squishing out the sides of the bun – promise! It contains B vitamins, copper, magnesium, phosphorus, and zinc. 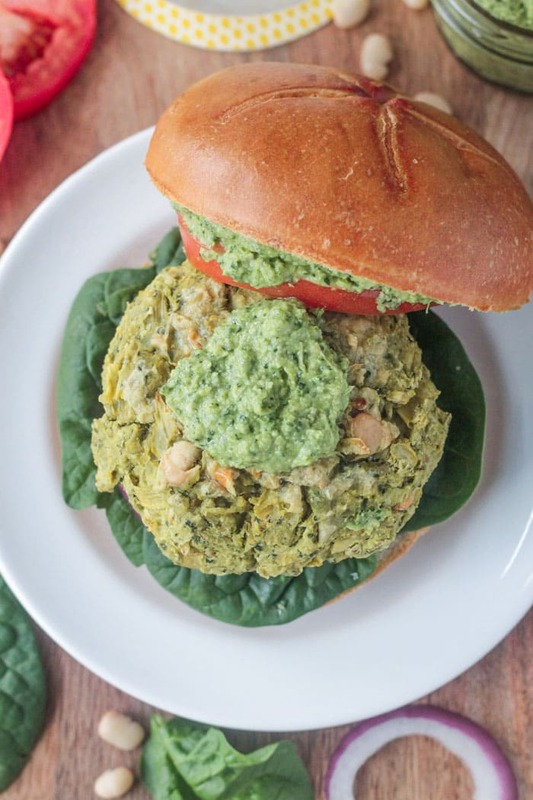 I hope you guys love these Spinach Artichoke White Bean Burgers as much as we do! 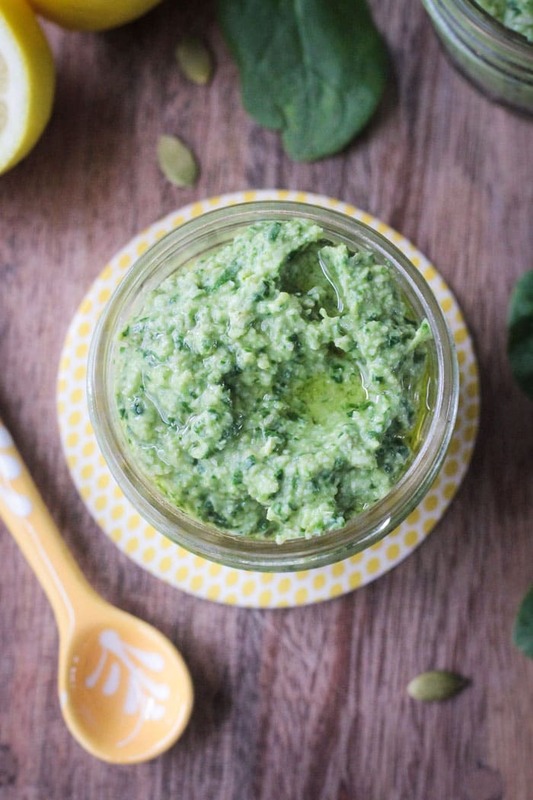 Don’t forget to slather them with the Spinach Artichoke Pesto! If you make these, please come back and leave me a comment below with your feedback with your star rating. You can also find me on social media Be sure to tag @veggie_inspired and #veggieinspired so I’m sure to see it. Enjoy! 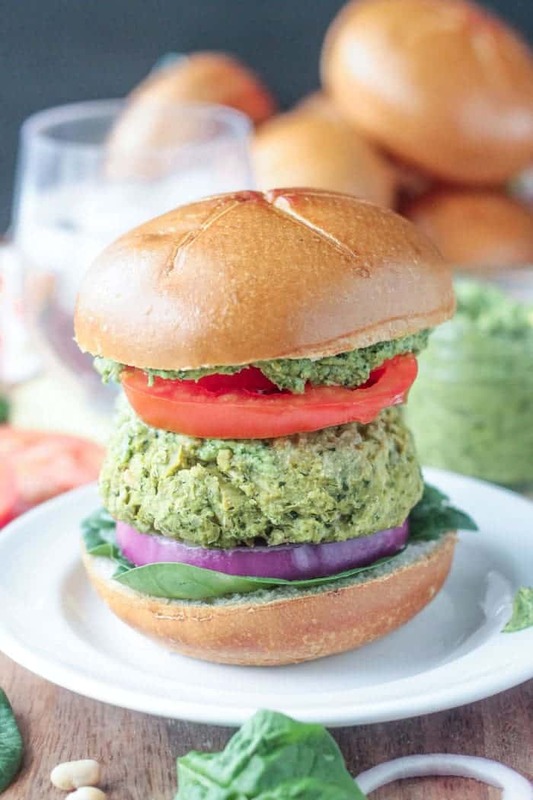 Spinach Artichoke White Bean Burgers – all the flavor of the delicious dip in burger form! Super easy to make, dairy free, and gluten free too! Preheat oven to 350 degrees. Line a baking sheet with parchment page and set aside. In the bowl of a food processor, pulse the spinach, pumpkin seeds, garlic, salt, and nutritional yeast into a find crumb. Add the white beans and artichokes and pulse 2-4 times JUST to break them up a bit. You do NOT want to puree them. Transfer the mixture to a mixing bowl. Add the tahini and stir well to combine. Add the brown rice flour and arrowroot powder and mix well. You may need to use your hands to really get in there and combine everything well. The mixture will be slightly sticky. Form the mixture into patties using your hands and place on the prepared baking sheet. Bake for 15 minutes, flip each one over, and bake another 10-15 minutes. Serve on burger buns with choice of toppings. The burger itself is oil-free, but the optional Spinach Artichoke Pesto toping is not. « Breakfast Nachos from Veganize It + A Giveaway! Jenn–is the nutrition count on these burgers for the burger alone or with a bun? Thanks. That’s a good question. I don’t remember what I did. I think probably without since the type/brand of bun would vary so much. Am enjoying these gorgeous burgers right now with the Spinach Artichoke Pesto. to fortify me for xmas eve gift wrapping.These are stick to your ribs satisfying even with no bun and a new variation on a bean burger for me. I ran out of arrowroot flour and subbed a cpl Tbs of GF Panko–worked really well and I may sub 1/4 cup next time. And great for B vitamins–so good for everything it seems. Thanks Jenn, you’ve done it again. You’ve become my go-to source for creative and delicious. Oh, thank you so much, Judy! I’m glad you are enjoying them. I hope you had your family had a wonderful holiday! Thank you, Sina! They are super flavorful! 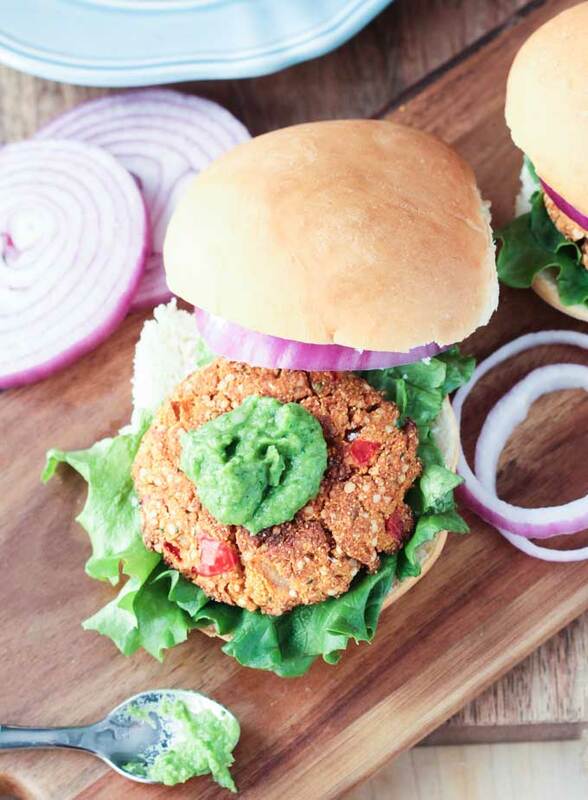 You are the queen of veggie burgers! These look so yummy, and I love the green color! HaHa! We do eat a LOT of veggie burgers around here! 🙂 Thanks, Sarah! All of the photography paid off! The burgers look phenomenal, Jenn. And as a big pesto & artichoke fan, I’d be all over these. Thank you, Cadry! It was a labor of love for sure! I think you nailed photographing the burgers, Jenn. They look amazing! Thank you so much, Linda! It took 5 photo sessions!!! The color is so hard, but thankfully, I got some decent ones finally. So much goodness stuffed in a bun!! Love the simple ingredients too especially for such a flavourful burger! Thanks, Leah! They are super easy to make! I love all the green! This burger screams healthy to me. It’s definitely packed with healthy veggies and greens! Now that’s a guilt-free burger that I can get behind. Love the addition of artichokes, absolutely brilliant! Thank you! You definitely must love artichokes to enjoy these! When I make pesto, I want to put it on everything too! I love that you used white beans in your burger. I used to have something similar when I lived in CA. I can’t wait to try the burger to see if it tastes as delicious as it looks! Oh, gosh, yes! Pesto is so bright and flavorful. I’ve been enjoying it on crackers as a snack and I can’t get enough! Cali food is the best – I wish the midwest had more veggie packed dishes. Everything here seems so heavy! This burger is pure genius! Love all the nutrient rich goodness you’ve packed into these! I need these to make an appearance in life asap! Definitely veggie packed! Thanks, Lindsay! Oh my! What an awesome combination – spinach and artichoke all in a comfort of a burger. They must be satisfying and the fact that there is not much flour – these are totally for me. Definitely heavy on the veggies! Thanks, Meeta. I hope you love them! Spinach and artichoke is such a great combo. And who doesn’t love burgers?! This looks like a must try! True – I haven’t met anyone who doesn’t love a good burger. This one may not be traditional, but it sure is yummy! Thanks, Sonali! What a beautiful burger! I love the artichoke and spinach twist, this is not a boring bean burger! Thank you! Definitely not boring! Lots of flavor here. Such healthy burgers and totally the kind I like to eat. I love the idea of serving them with the pesto. Yum! Thank you, Mel! It was a nice change from our usual Mexican spiced burgers. Wow, what an ahhmazing burger!! I bet the flavors are spot on! Will have to give this a try! Thanks, Taylor! This definitely isn’t one of those “hidden veggie” recipes – they are there in full glory. Enjoy! Now that is a beautiful burger! Love that you added spinach. I do that and hubby looks at me funny, lol. I thought my family would be leery of the green color too, but sandwiched between the bun, they didn’t even really notice. And my kids ate these with ketchup and mustard – wouldn’t be my first choice, but they liked it. LOL! This is seriously GENIUS!!!!! I looooove spinach-artichoke dip so to have it in burger form is amazing. It looks so hearty and I love the color!! And adding pesto on top is perfection. What a great recipe, Jenn! Thank you so much, Mandy! I haven’t had spinach artichoke dip in what seems like ages, but I did used to love it a lot. I hope you enjoy these! Well you know me and my burger obsession….you’d think I’d be sick of them now but nope. Bring them on!! I can’t wait to see all the flavors you’ve come up with! So much green goodness going on here! Spinach and artichoke is such a great idea for a bean burger! 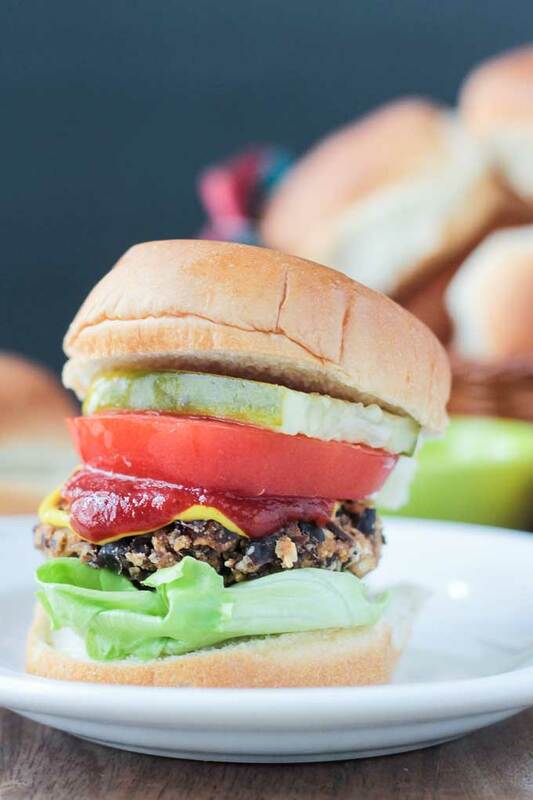 I love the spinach-artichoke flavor combo, and I’m totally drooling over these burgers! Thank you, Dianne! Such a classic and delicious flavor! Thanks, Kelly! They are a good match for sure! Oh my… I must admit I’m having a bit of a love affair with bean burgers lately. So any excuse to make/eat more sounds like a win to me! Thanks for sharing, adding this to my list of must try! Thank you, Kristina! We eat bean burgers all the time too. Usually Mexican flavored though, so this was definitely a nice change of pace! These look so good! I’m loving that sauce on top. 🙂 The sauce is sooo good! These look so fulfilling and the flavor combo MUST be flavorful. I love that you went light on flour. I’m not a big fan of veggie burgers with tons of breading / grains. It’s like eating bread on bread on bread. I want some beans and/or veggies in there instead! Just enough to hold everything together, but yeah, the veggies are the stars! Thanks, Alisa! This looks like my kind of burger! I love spinach and articoke everything so I know I’ll love this. Excited to try it! Thanks, Mary Ellen! It’s a nice change from all the Mexican spiced burgers we eat!